Feature: SUSE 1.09. Slackware-based Linux released in 1994. 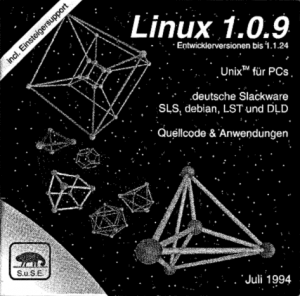 In 1994, in support with Linux expert Patrick Volkerding, Slackware scripts were translated into German and English languages, which was marked as the first official release of S.u.S.E. Linux 1.0 distribution. First time it was available first on floppies, and then on CD.